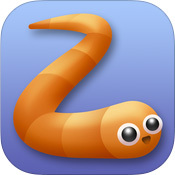 Harkening back to Snake, the classic game played on graphing calculators everywhere before smartphones became a thing, slither.io takes the classic 'eat and get bigger' formula and modernizes the heck out of it. Trying to eat pellets in order to get bigger, while simultaneously trying to avoid crashing into your ever-expanding body was pretty tricky, but now it's a free-for-all fight for survival in online arenas populated by dozens of other players. There's no end to slither.io. Rather, the goal is to become the number one player on the leaderboard - and hopefully stay there. This is much easier said than done, of course, because one wrong move or slip up can easily get your snake killed. Whenever a snake dies, it leaves behind a lot of pellets. The bigger the snake, the more they drop. Be careful around large pellet clusters. These usually come from defeated players, and big ones will likely result in a whole lot of scavengers zipping all over the place. Feeding frenzies can be a deathtrap if you aren't paying attention. Running into other players, no matter how large or small, spells death. So watch where you're slithering! You can't touch other players, but you can loop back over yourself no problem. Remember that your own body isn't an obstacle if you find yourself in a tight spot. Even the smallest snakes can take out giants. No matter what size you may be, you can still pose a threat. Extremely large players can go down just as easily as tiny ones if they run into your snake's body. The center of the map is usually where all the action is. You'll no doubt see other snakes on the periphery, but the largest player concentration is almost always towards the middle. If things get too intense, consider moving to the outside for a bit. slither.io is a very simple concept made significantly more complex (and interesting) due to the inclusion of so many other players. As with its classic inspiration it still requires decent reflexes, but really it's more about playing head games with everyone else. Download it for yourself and see what all the fuss is about. Those old enough to remember Snake likely remember it fondly. It was a very simple idea with a simple execution, but it was also quite compelling. You had to guide your little line of pixels around the screen gobbling up dots, which in turn would make your proxy snake a little bit longer. What made is so clever is how it would build upon itself. A longer body meant you had to be more careful about how you moved - lest you run into yourself and fail - but you also needed to nom as much as you could in order to get a higher score. That incredibly basic but just as satisfying gameplay loop has been modernized several times over the past 40 years (oh my god it's been 40 years), but slither.io might just be the best reimagining yet. 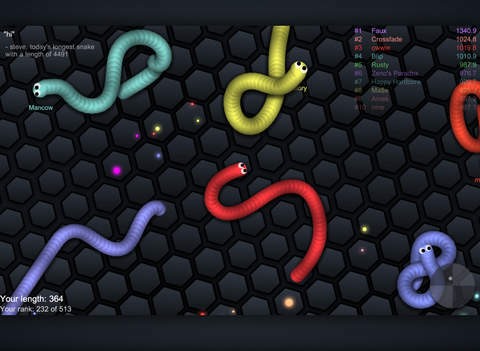 slither.io follows most of the basic rules from the original Snake: namely the one about needing to eat pellets to grow bigger and get a higher score, and the one about not crashing into stuff. Okay so it follows the only rules from the original. There are two major differences to the basic setup this time around, though. First, your own snake doesn't have to worry about crashing into itself - it just loops over its own body instead. Second, movement is no longer limited to a grid-based up, down, left, and right. These seem like extremely simple changes, and the kind of are, but they make a profound difference. Getting around is much easier and allows for more opportunities to get out of (or into) trouble thanks to the 360 degree movement, for one thing. Being able to cross over your own body is also a game-changer because it allows you more potential avenues of escape and plays off of the previously mentioned movement system quite well. 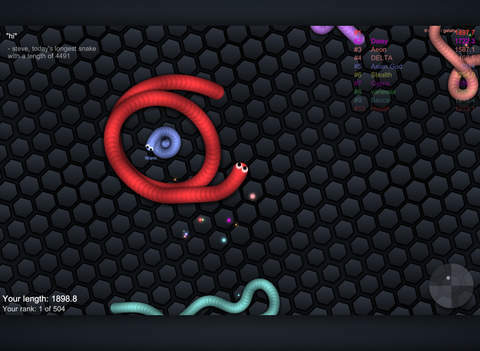 All those gameplay changes are cool, but by far the best part of slither.io is the fact that it's 100% online with dozens of other players all competing for the top spot. Everyone starts off with a tiny snake and has to gobble up all the pellets they can in order to increase their score (and size), naturally. However, having so many competitors in one big free-for-all makes this simple concept a lot more intense and satisfying. It's really cool to watch your snake begin to dwarf other players, and it's really intimidating to see those who are even further along who are so big they look like moving walls. It's also really cool how a snake's size doesn't give it the advantages you might expect. Bigger snakes have more mass and can encircle smaller ones more easily, sure, but they're every bit as susceptible to death as one that's been freshly-spawned. On top of that, death will result in starting back at square one, so the larger the snake and the higher a player's score, the scarier things get and the more careful they have to be. The downside to all this online mayhem is that the game tends to lag fairly often and always at the worst times. It never lags for very long, but even a second of delay is all it takes to prematurely end a run. Playing offline against AI snakes avoids this problem, but it also doesn't offer the same levels of satisfaction or challenge as playing against real people. slither.io is one of those rare multiplayer games that even I, with my aversion to competitive play, can appreciate. It certainly does have its share of annoyances, though. Not just from the lag but from the occasional lapse in concentration or lucky shot from another player. Though it's easy enough to overlook those issues when you're having so much frustrating fun.